Birthday Feast! | ___is black the new black? It was my mother’s birthday yesterday. My present to her was her favorite meal: homemade pasta and sauce. So we have a green salad (courtesy of my mom), rosemary olive bread (more on that below), meatballs, pasta, tomato sauce and my go-t0 green beans with lemon zest and pine nuts. Making pasta is one of those things looks harder than it is. Really when you come down to it, it’s more tedious to make than it is difficult. It’s worth the effort though. There is nothing quite like it. The meal came out well, I think. I really wish I did not have to use canned tomatoes for the sauce. They’re ok, but not the same as sauce from fresh. So this summer I am determined to get a bushel of tomatoes from a farmer’s market and make and freeze sauce from scratch. Anyhow, I am really really proud of the bread. I have made the Mark Bittman no-knead bread before, but I’ve always done the shortened version (the one that takes about 12 hours). This time, I went for the 24 hour version. Half whole wheat flour, half white. flour. I added in chopped, pitted oil cured olives and fresh rosemary. Coated the dough in olive oil and let rise for 18 -20 hours. This is the result (well there’s another rising in there, but you get the idea). 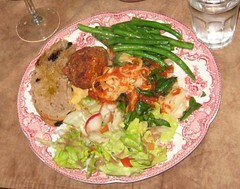 It was great to celebrate with friends and enjoy this meal. 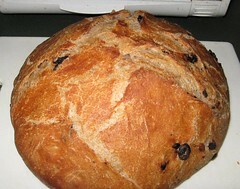 And now, I think I am going to go enjoy some salad and a slice of this bread for my supper. This entry was posted in baking, meals, menus. Bookmark the permalink.